" MY FISH HAS A TOOTHACHE "
" Charlie! " I yelled, " Get your hand out of the fish bowl. Your going to make him sick. " I cant tell you how many times i have flushed a guppy, or goldfish down the toilet. I would rush to the pet store to buy another one, before Charlie realized his fish had died. The last fish i bought. Was a large goldfish, we named Jaws. Charlie really loved that fish, and was constantly feeding him, and making sure the water was clean. Charlies birthday was today, and i was busy getting everything ready, when Charlie runs in crying.
" Mommy! " The tears flowed from his eyes. " Susie hit me! " He stood there crying, and holding his arm.
" What are you two fighting over now! " I asked him, putting chocolate icing on his cake. I handed him the bowl,to lick the remainder of the sweet confection, hoping it would calm him down. It did, for a little while. He started pouting again, " Susie said fish dont have teeth." Charlie looks at me with his big blue sad eyes, " I told her they do have teeth, and she hit me." He started crying again.
" Ok! " I hugged him. " Lets go talk to Susie." Taking him by the arm, we went to Charlies room. Susie was sitting in the middle of the floor playing with her barbie doll. I told Charlie to play, while i had a talk with her.
" Susie, sweety. You shouldn't be hitting people. It is'nt nice." " But he called me a liar," she frowned, putting her hands on her hips. " Daddy told me fish dont have teeth, a long time ago. I looked at her and smiled, " Well lets pretend Jaws has teeth, so Charlie will have a happy birthday party." " Ok! " She shrugged, and ran back to play with Charlie. I finished the birthday cake, and decorations. The party was going so well. Charlie was having so much fun, and i've never seen him so happy. The party was winding down, and Charlie was busy playing with his gifts. Everyone had finally left, so i started cleaning up. Susies mom picks her up, and ask if it was alright if Charlie spent the night with them. I agreed, i needed some time alone anyway. I was totally exhausted from the party. I was taking Charlies gifts to his room, and picking up toys, when i noticed Jaws was floating belly up in his fish bowl. I walk over to check on him, and sure enough, another fish had to be flushed.
" 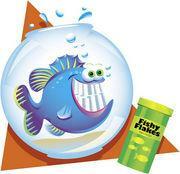 Poor Jaws," i thought, when i noticed a tube of Orajel laying beside his bowl. Beside the Orajel, was a note Charlie had written for me. It read... " Mommy, Jaws had a toothache, Susie says. I gave him some Orajel, like you do me when my tooth hurts. Love Charlie." Lol! Glad you enjoyed it Jenn. Thank you princess, glad you enjoyed it! like this one. Smiles M.
Where do you think i get most of my writing ideas. They are special, each and every one. Thanks Brenda! Sorry. Had to share lol. Its ok. I enjoyed it. Is'nt it wonderful what a parent will do, to keep their children happy. Do these towels smell funny?